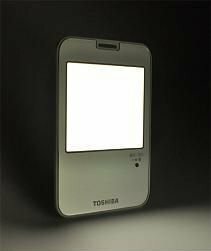 Remember Toshiba's portable OLED lamp? Universal Display donated OLED materials and technology for those lamps. It seems that Toshiba made the actual panels (which was a surprise to us because we didn't know they had an OLED lighting program) as UDC provided only knowhow and materials. This is the first time we hear of a collaboration between UDC and Toshiba, but we don't know whether it extends beyond this specific project. Toshiba will make 100 units of this lamp, and donate these to quake-hit areas (50 units were already donated to the evacuation center in Kesennuma City, Miyagi Prefecture). Toshiba has no plans to sell these to consumers.